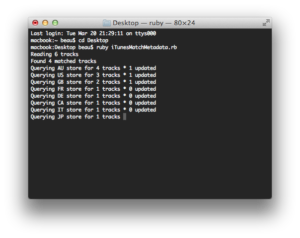 For this blog post, I’ll be using a ruby script created by @tapbot_paul, which I’ve tweaked myself to favour song results from the AU iTunes Store first (being myself based in AU). Before continuing, please make a backup of your music library – I’d hate for it to ruin your library, nuke your computer… and I’m not responsible! Every song in iTunes has its own unique ID – this allows you to create a direct link to the song, and can be used by Ping etc to make sure you ‘like’ the right song from the right album. Usually only songs purchased from iTunes have this ID inside them; luckily, music downloaded from iTunes Match (that is, those with a kind of ‘Matched AAC audio file’) actually do have this ID inside them. If your music isn’t a Matched AAC audio file, ensure that the song has an iCloud status of ‘Matched’, then proceed to delete the song from your computer (not from iCloud), then redownload it again. Apple also provide an API for developers to look up song metadata using the iTunes song ID – perfect! To sum up, this will only work for music matched with iTunes, and has a ‘kind’ of ‘Matched AAC audio file’. First up, we’re going to require a few things to get this script working. You also need to put tunes.rb into your iTunes folder. Open up Finder, open the Go menu, and choose ‘Go to Folder‘. Now you’re all ready to start. 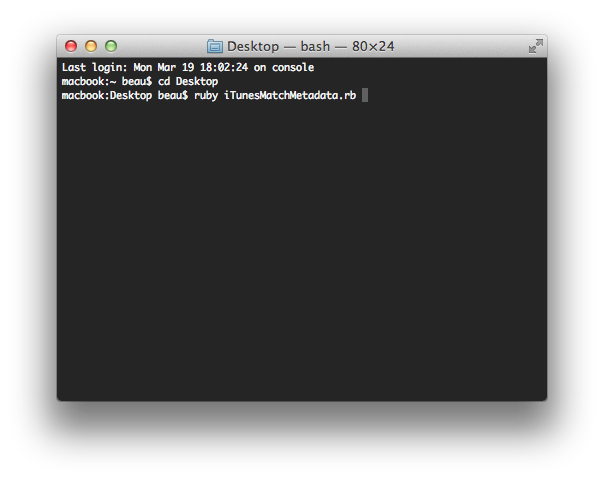 Put the iTunesMatchMetadata.rb script on your desktop – this will make it easy to launch and run. And now we can launch the metadata script! Assuming you did select songs in iTunes, the script will look for songs with a kind of ‘Matched AAC’ and look for IDs, before querying a whole range of iTunes Stores. When songs are found, the metadata is simply overwritten into the songs. you’re done! Check iTunes for your freshly ‘fixed’ metadata. 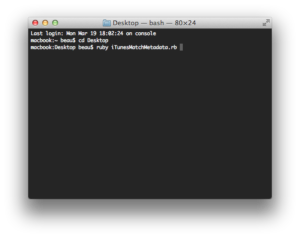 If you’re not on OS X, or the thought of Ruby and the Terminal frightens you, there are other tools available. I haven’t tested and therefore cannot vouch for their success/failure, but you’re welcome to try and comment here! Let me know how you get on and leave a comment with your 2¢! It doesn’t do a thing! Please help..
Hey Elrik – you can try the other application mentioned at the end of the post – else unfortunately you may be required to download XCode. Probably because you have to install the Command Line Tools with XCode. 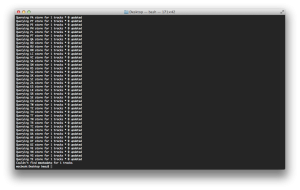 With OSX Lion they disabled a lot of commands in terminal unless you install the Command Line Tools for developers. 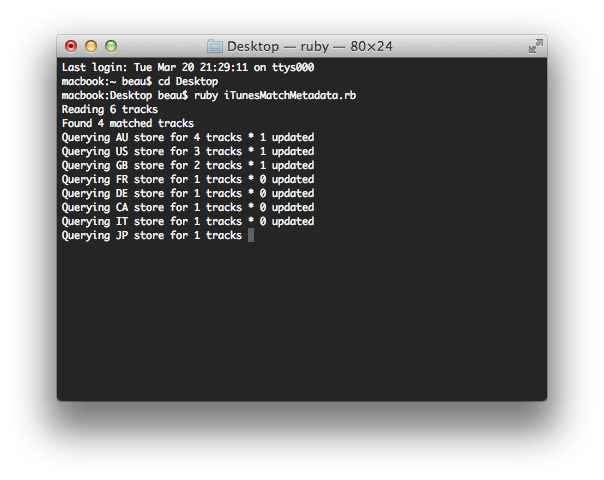 Gem files will remain installed in /Library/Ruby/Gems/1.8/gems/json-1.7.3 for inspection. Any suggestions? I would love to update my metadata! So now it works!!! Thank you for sharing this. What a great thing. Hey Stephen & Joshua; have finally updated my post with the tweaked and fixed script. What would it take to make this work on 10.6? I’m stuck on a 64bit iMac that cannot be upgraded. Thanks! You can get Xcode from the Mac App Store. You’ll need at least version 4.4 of Xcode for it to work with OS X Mountain Lion. After the installation, open up Xcode in your /Applications folder. You’d want to go to Xcode -> Preferences -> Downloads tab then install the “Command Line Tools.” After you’re done, quit Xcode and fire up Terminal and follow the steps mentioned prior. Thanks Appleman; have added this to the post. 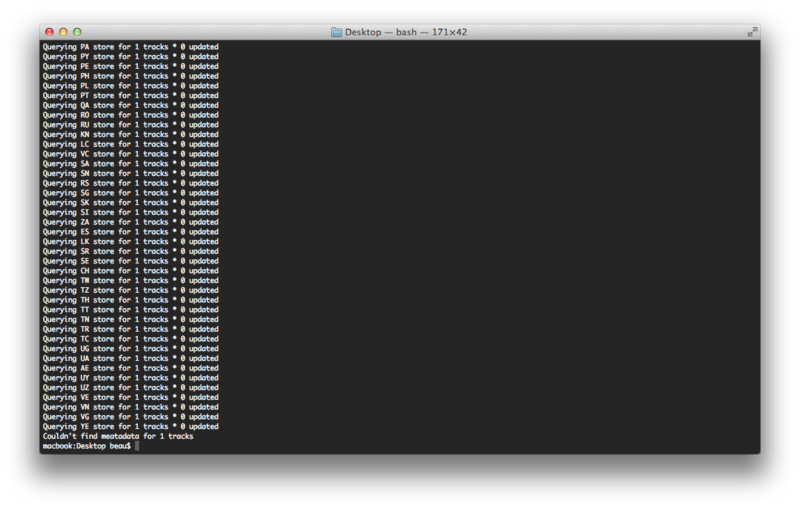 Worked fine (also in iTunes 11). However I needed to change the language of my system preferences to english. MESSAGE: Can't make some data into the expected type. I’m getting the same error as George. What goes wrong? Issue seems to be when iTunes store doesn’t have an album associated with the song. The code can’t handle an empty album name. Just place a little if statement in the “update_track” method. I’m a total nitwit. My script now looks like below. Just remove line 36 and voila! Does this add the copyright tag as well? Could you please explain what you mean by ‘copyright’ tag? 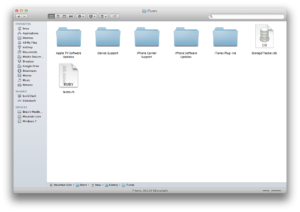 This script should only change the title, album and artist fields, without touching anything else. By copyright tag I mean the record label field that appears under the title, album and artist tags when clicking on “Get Info” on iTunes. Thank you for the reply in advance. I absolutely loved this post, and I had no problems running the script. Thanks so much! The only question I have is if there is any way to make this script gather and replace any other information, like genre, year, explicit/clean, etc? Or is that related to a limitation of the API? Only AU store and no others. Can U help me ? Where can i find tunes.rb and itunesmatchmetadata.rb? Have you found a workaround for tracks that are not found in any of the stores? Seems odd to me that ANY would be skipped if they are still available on iTunes. Awesome script! I can’t thank you enough. Thanks! This works like a charm. I fixed up a couple hundred tunes tonight that had been resisting everything else. This was working fine on my iMac with OS 10.8 today I updated to OS 10.9 and now it’s not working. what do you think changed on 10.9 ? Can anyone see whats the problem of not getting any updated tracks? This is working quite well, however I have the same question as some of the guys above, i.e. Lala and Anthony. Is there a way to edit the script so that it adds other metadata, e.g. Copyright information and explicit/clean tags? I have tried adding to the script myself (although I really am no expert) but I can never get it to work. Replies would be much appreciated (either from the author or someone who knows how to do this).